Hand a person a box of tacks, a book of matches, and a candle. Ask them to mount the candle on the wall. Most people first start by making a shelf of tacks on the wall and then attempting to mount the candle on the shelf. Once they realize the box is empty and they see the shelf they think: I can use the box as a shelf and they correctly mount the box to the shelf with the tacks and put the candle in the box. Facebook bought Oculus Rift. Facebook bought Whatsapp. Months later we are just now seeing how those first steps are leading to the next steps. Oculus Rift lets people experience virtual worlds with other, real people in real-time. Whatsapp is a messenger platform. Facebook is a social media platform, which also features a heavy game element and already had Messenger. Messaging is already a bigger platform worldwide than social media and is set to grow. Gaming platforms like Steam, Xbox Live, and Battle.net are likely where Facebook is headed with their VR set, but I’m guessing they will have a live-meeting aspect as well. When I was young I used to have a third place to call my own. It was called “The Blue Lounge“. When that was threatened, I built an outdoor Blue Lounge. When that was taken away, I kept looking. I kept looking for a place that I could meet my friends and have a conversation. I dreamed of a day where I could virtually sit in a room with people just like I could back in the Blue Lounge. Now that day may be approaching. I hear you. Get coffee together when you can. We’re not animals. Get out of your storage shed, onto your motorbike, and get down to The Raft to be with other people now and again. It’s good for you – and you just might save the world. How Will Tablets Affect My Kids? I wondered if I was making the right decision. I didn’t know. Amazon was having a Prime Day. There were going to be sales. My wife said she wanted tablets for the kids. I bought 3. What effect would it have on the family? Would they ever talk to me again? How would we keep them from breaking them? How would we keep them safe online? I didn’t know. I’m an IT guy, but I wasn’t looking forward to setting up 3 tablets at once (one Mini iPad and 2 Kindle Fire HDs for Kids). I didn’t setup any of them. My wife did it. That was nice. My second oldest daughter Skypes with her friend in Chicago and sets the tablet next to the computer while she’s playing Minecraft. She already has a webcam. I’m not sure why she does this. My oldest son likes downloading books and games to read. 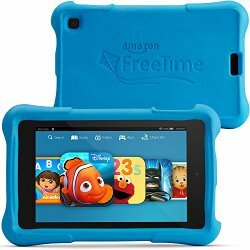 Books, movies, and TV shows are included in Amazon Prime on the Kindle Fire HD for Kids and parental controls are great. Longer movies can be downloaded to view offline while in the car, but we limit their time on the tablets and have them locked via a pin code. We can also set it to turn off at a certain time of night. When I came home from work today, the kids were sitting around the dinner table eating pizza and my oldest son showed me his favorite game: Teenage Mutant Ninja Turtles. Nice. I have no delusions about them somehow becoming smarter or more tech savvy from having the devices, but I have noticed it’s dramatically changed how they interact with the world. My son takes pictures with his Fire and shows me a slideshow. I get to see the world from his point of view and see the pride he has in presenting me his work. “That’s the best one!” he says. They still greet me when I come home and hug me before they go to bed, but they also come over just to ask me to unlock their tablet (versus asking me for my phone when I get home). When I was growing up we had Nintendo and VHS tapes. This is the same thing, replaced instead by apps and instant video streamed over the Internet. Ok, it’s actually quite different. The easiest way to use Gmail with your organization is to buy Google Apps, but sometimes that’s not possible. However, there is still a way to use Gmail with your company email address. How do I get my email in my Gmail account? There are a couple of ways to do this. Your web host may have the option to forward your email to your Gmail address. Check with your company’s IT department to see if this is possible. If that is not possible, the next best option is to have Gmail check the email the way Outlook does using “POP”. How do I add a POP email account in Gmail? 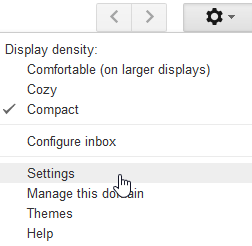 In Gmail, click on the gear ‘settings’ icon and click on “Settings”. Click the tab “Accounts”. Click “Add another email address you own”. A pop up will appear, enter your email address “youremail@yourdomain.com” and click on Next Step. The way this is done varies by web host. In the following example, I will be using specific instructions for 1and1 webmail. Under Username enter your email address “youremail@yourdomain.com”, enter the password you usually use for your email address. For 1and1 email use POP Server: pop.1and1.com and Port: 995, check the box “always use SSL” and check the “Label Incoming messages”, (Note: if you would like to keep a copy of your emails on your 1and1 server, check the box “Leave a copy of retrieved message on the server.”) and finally click on Add Account. Click finish, go back to your inbox, and wait for the confirmation code to be emailed to you. Since it is forwarded to your email, it will come to you. Copy the code and go back into your settings > accounts and add in the confirmation code. You will now also be able to “Send as” this new email. It will be an option in a drop-down menu when composing new emails. How would I put this on my cell phone? The simplest way is to check it via the Gmail app in your phone after you add it to your Gmail. How do we create a signature for it? For signatures, you have to setup the signatures in Gmail. In the General tab you can setup a different signature for each email account listed in Settings > Accounts. While the Gmail app on your phone won’t show the signature on the screen, it will attach the signature on send. When you go to send an email from your Gmail app in your phone, click your email address. A drop-down list will appear. Choose the email you want to send from and it will use that signature.